On October 18th at the Autonomy and Urban Mobility Summit in Paris, the Volocopter team announced that it will collaborate with the government of Singapore to begin testing its eVTOL air taxis in the second half of 2019. 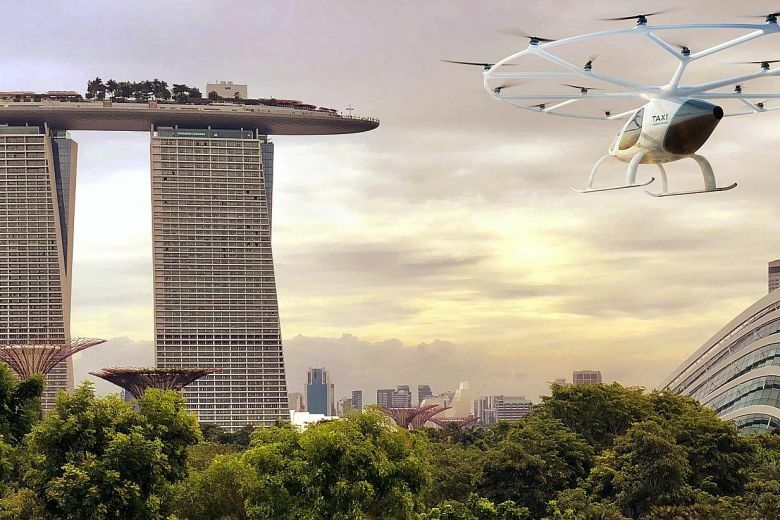 The goal of Volocopter’s coming tests in Singapore is to validate feasibility of establishing air taxi services in an urban environment like Singapore. Although Singapore has not yet committed to enlisting Volocopter services, Volocopter will use the 2019 flight test to identify the routes in Singapore with the most potential for success. It is currently seeking real estate partners to collaborate on the infrastructure aspect of testing, and is setting up design and engineering teams within Singapore. 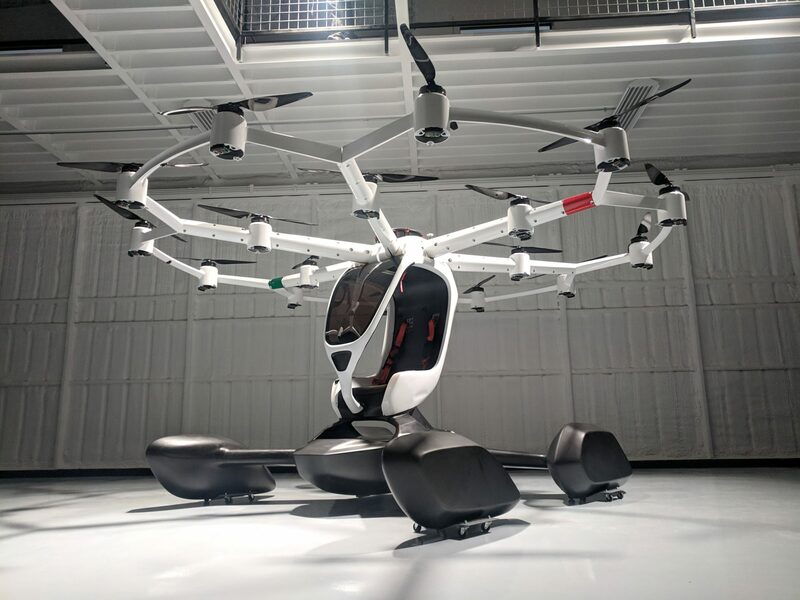 The Civil Aviation Authority of Singapore (CAAS) has stated its belief that vehicles like the Volocopter 2X have the potential to transform logistics and mobility in the urban environment of Singapore. 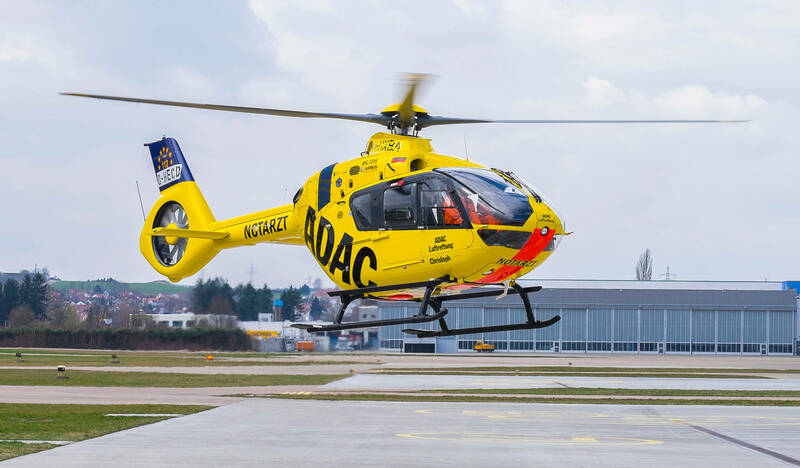 The CAAS and Volocopter are currently working together to ensure that all requirements such as safety and noise pollution are met and to determine the full scope of the tests before they begin in 2019. These tests will culminate with a public flight demonstration to heighten societal confidence and acceptance. 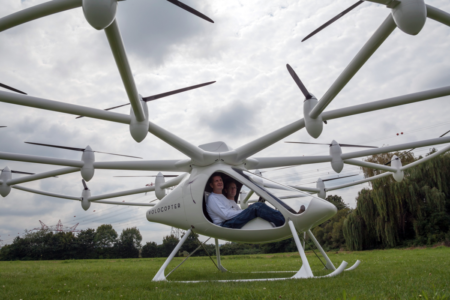 Volocopter is based in Germany and is primarily backed by Intel and automobile firm Damlier. The Volocopter 2X can fit up to two passengers and has a range of about 18 miles. It is fully electric, and can be flown either fully autonomously or by a single joystick that controls the main functions of the aircraft. Volocopter is still working with the CAAS to determine whether Singapore testing will be manned or autonomous. 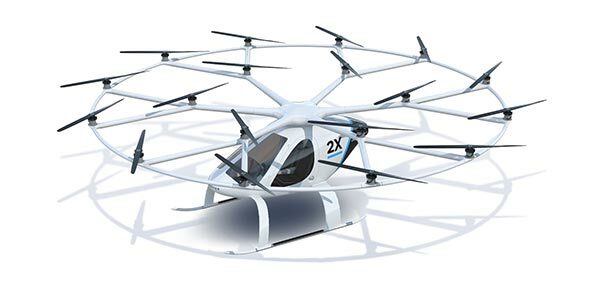 Learn more about the Volocopter2X. The Volocopter 2X has held a preliminary permit to fly in Germany since 2016. In September of 2017, it completed a successful flight test in Dubai. 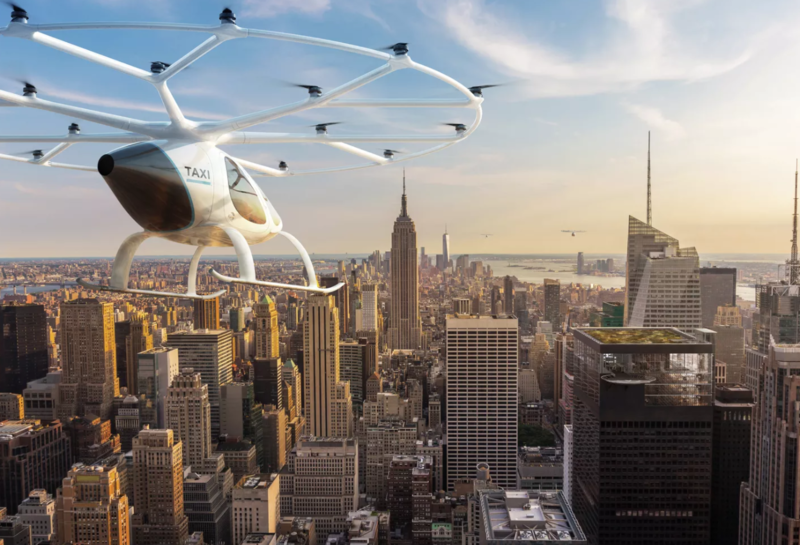 Volocopter is collaborating with other cities as well, and has stated its expectation that air taxi services will begin operation within five years. The Volocopter 2X is one of the most visually remarkable eVTOLs today - featuring almost 20 propellors (18, to be exact) all arranged in a circular symmetrical pattern. Volocopter has been successful thus far in garnering public support and even in hosting ride-along events for high-profile individuals. Volocopter, based in Bruchsal, Germany. 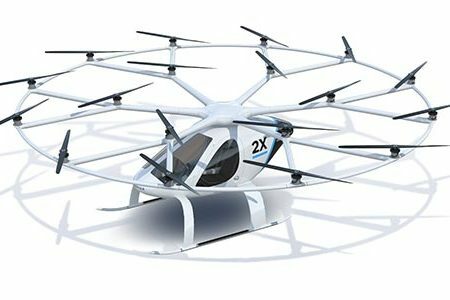 Volocopter leverages engineering experience from Germany and a very successful marketing and placement campaign that has promoted its V2X eVTOL to a variety of potential customers worldwide. Most notably, the public demonstration of the V2X in Dubai attracted a large amount of attention and interest in the V2X, and the continuing high performance in flight demonstrations and testing should enable Volocopter to place themselves in a competitive spot for certification of their aircraft - one of the last hurdles they must clear before the V2X is produced and commercially delivered. 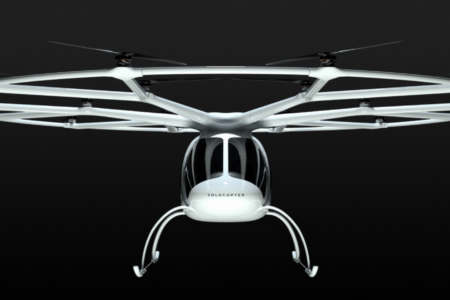 Volocopter is absolutely an important eVTOL player to watch in the coming years. 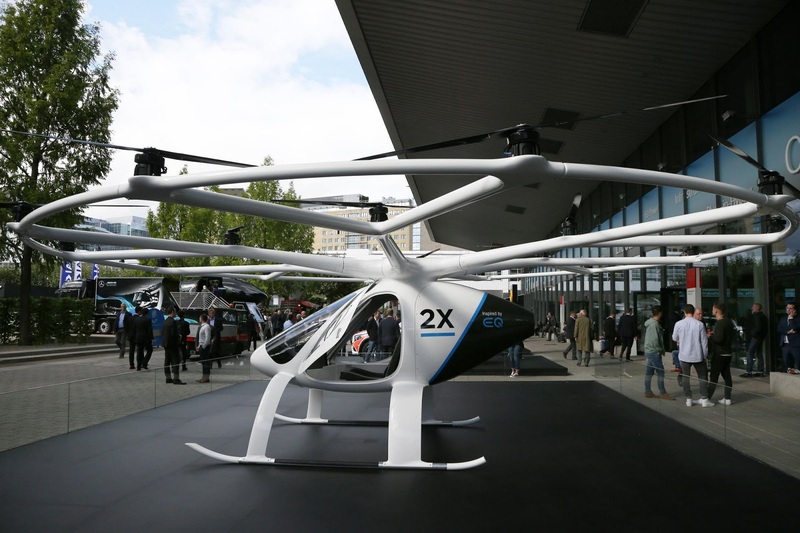 Volocopter displayed their VC-200 flying taxi at the CeBIT Tech Fair on June 12th in Hannover, Germany. The CeBIT Fair runs from June 12-15, and is focused on “Future Mobility, Artificial Intelligence, and VR”. The VC-200 model was on display for visitors to experience. Volocopter’s presence at the fair marks one of the most well-known flying taxi manufacturer’s continued promotion in its home country of Germany. Volocopter is based in Bruschal, Germany, outside of Stuttgart. Why it’s important: Volocopter’s progress towards certification is continuing, and their appearance at CeBIT will most likely bolster public sentiment and approval toward a company who’s certification path lies through EASA, the European Air Safety Agency. Volocopter is one of the few flying taxi companies in Germany currently pursuing certification within Europe, as a large number of other manufacturers are heading overseas to follow alternate routes that may reduce delays in bridging prototyping to production models. 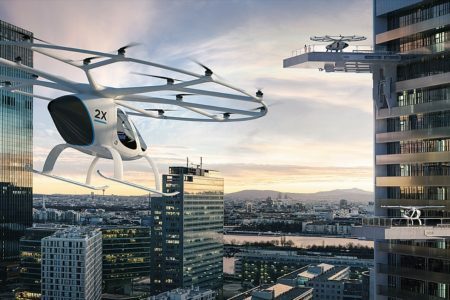 German Volocopter released their concept flying car vertiport that will compete with Uber Elevate’s plans to advance flying car and taxi infrastructure in cities. The planned “Volo-ports” will include infrastructure for up to 1,000 passengers to either load or disembark from Volocopters, and the entire experience will be housed on rooftops in urban areas. The Volo-ports will have 3 additional decks below the surface of the landing space to house maintenance and auxiliary charging stations. Additionally, there will be battery-swap stations on the top deck that allows the Volocopters to continue operations throughout the day without stopping to recharge. 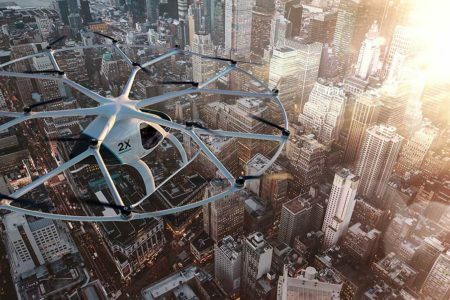 Why it’s important: While Uber has already released their concept for what a flying taxi port may look like, Volocopter’s entry to this space indicates that there is growing sentiment towards developing the infrastructure for flying cars and taxis. Future plans for infrastructure are also in work by FlyBlade – read our article on their recent fundraising to build vertiports here. Volocopter may be the new alternative to the flying car – and it has flight tests under its belt to prove it. 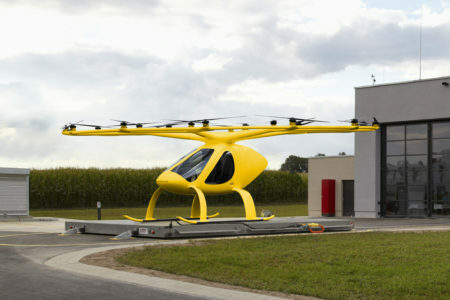 The 16-rotor manned eVTOL aircraft (dubbed the VC200) is built by German manufacturer Volocopter and tested in Karlsruhe. 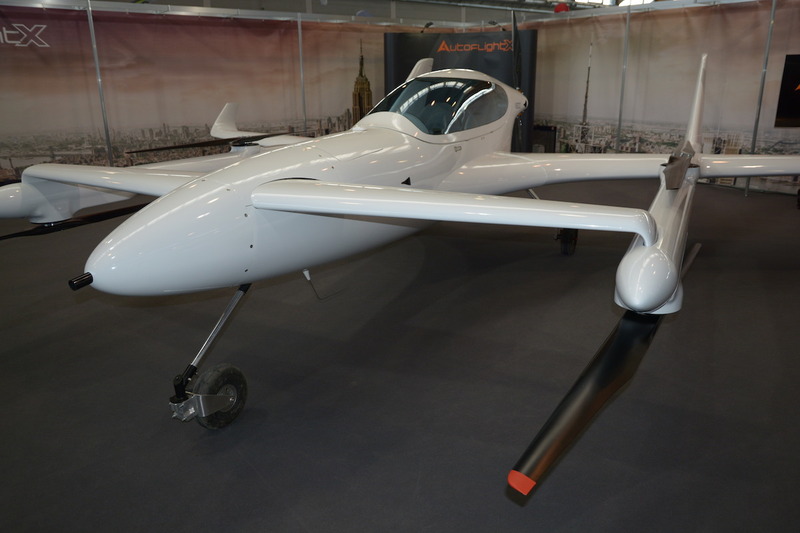 The VC200 is estimated to fly at an altitude of around 2km with payloads of up to 450kg. The Volocopter VC200 was so unlike anything German aviation authorities had seen before that the aircraft was registered under a new category in order to comply with flight regulations. Why it’s important: Volocopter was previously featured on transportup.com when the company was seeking additional funding after their 2012 introduction of the VC200. 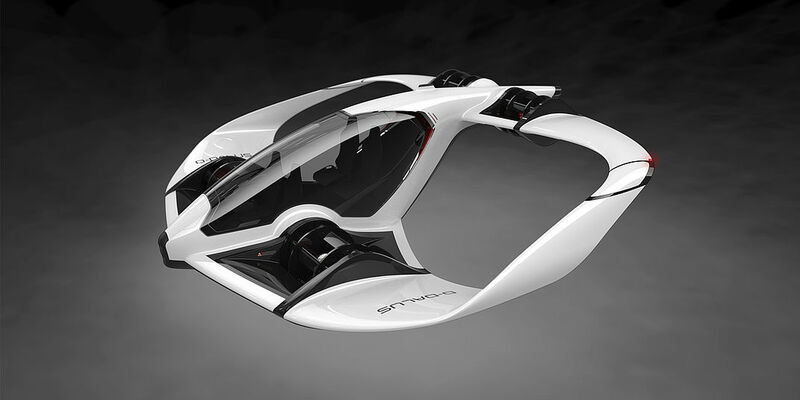 Six years later, their concept is finally coming to fruition, and represents a functional flying taxi eVTOL aircraft that is ready to use once certification and public sentiment catch up to the rapid technological development of the flying taxi industry in recent years. 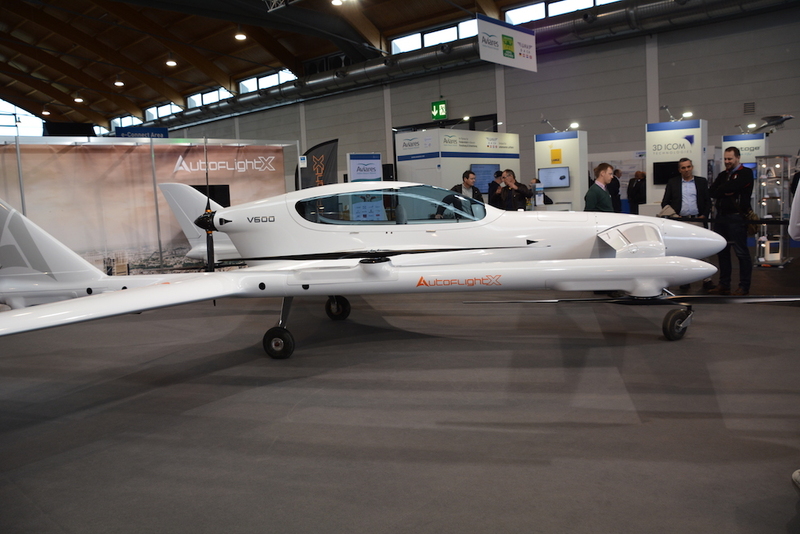 In a recent interview documented by AINonline, CEO Bye stated that the “eFlyer’s primary markets [are] flight training and air-taxi services, [so] it makes more sense to make the price of the airplane as reasonable as possible.” This was after the announcement at Aero Friedrichshafen in Germany that solar cells would no longer be standard on the eFlyer wings. It is evident that the Bye’s recent development and testing of the eFlyer has caught the eye of many operators, as nearly 300 orders have already been placed for the two-seat configuration. Up to 60 of the aircraft orders have come from Norwegian flight school OSM Aviation Academy, while another 18 orders have come from Norwegian partner Elfly AS. 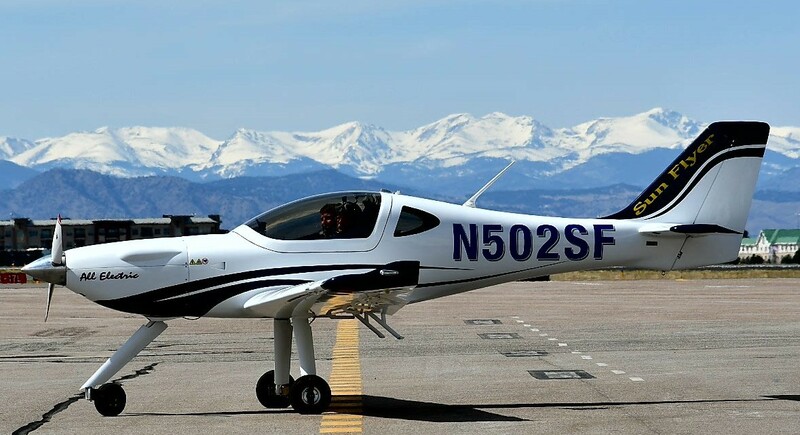 Elfly CEO Eric Lithun went as far as to say that the eFlyer will be the “Tesla of the general aviation industry.” OSM Aviation Academy is committed to the development and operation of more environmentally friendly transportation, and urges the airline industry to do the same. Why its important: While the Bye Aerospace eFlyer has a traditional aircraft configuration and is not capable of vertical takeoff and landing, its electric powerplant may enable shorter range flights with quicker turnaround times. 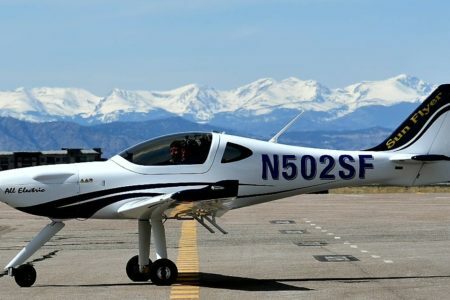 In addition to flight training schools, Bye is targeting air-taxi operators as a potential customer of its new all-electric aircraft, where the company may have a competitive advantage to other electric-aircraft manufacturers if it succeeds in being the first Part 23 FAA-certified all-electric aircraft. Honeywell Aerospace products and services are already found on virtually every commercial, defense and space aircraft. 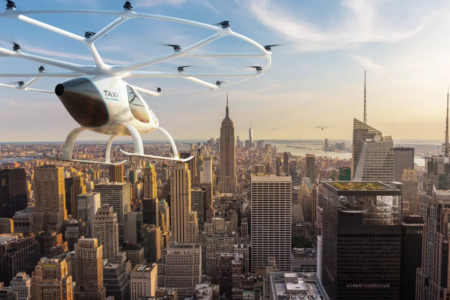 Recently, the company has displayed its commitment to investing in the urban air mobility industry with multiple partnerships. In January, it was announced that Pipistrel and Honeywell will “combine aerospace expertise to address the technical, regulatory and business challenges of the emerging on-demand mobility market” – an effort that will leverage Honeywell’s avionics, navigation, flight control systems connectivity, and other beneficial products and services onto a future Pipistrel vertical takeoff and landing air vehicle to support fully autonomous operations in the future. Further, Honeywell announced plans to have its autonomous navigation and landing technology aboard the Volocopter, an 18-propellor electric VTOL aircraft based in Bruchsal, Germany. 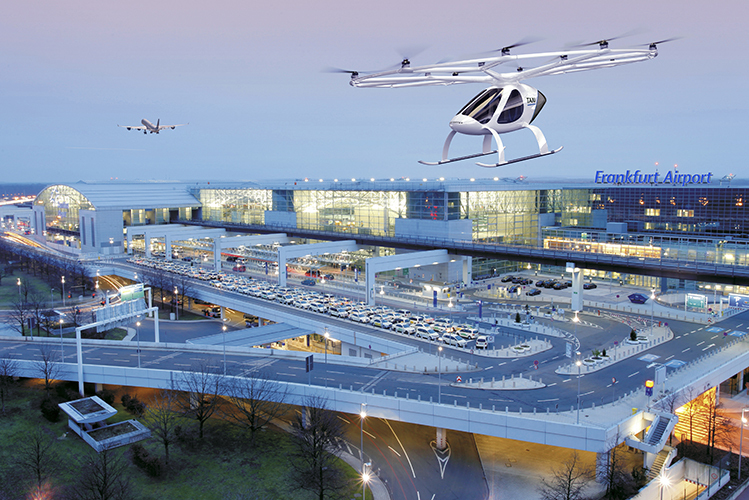 Image of the Volocopter 2X at Frankfurt Airport. 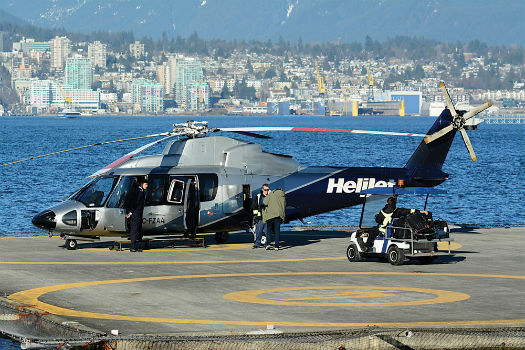 In addition to recent partnership announcements, Honeywell has been developing a hybrid-electric turbogenerator with a primary purpose of adapting it to vehicles in the urban air mobility industry. 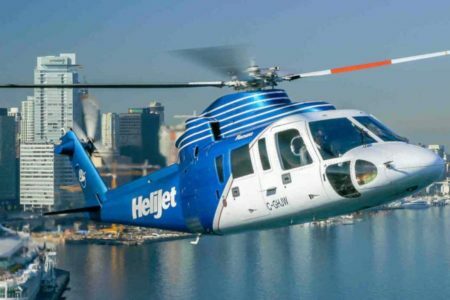 This powerplant is an electrified version of a 1,100-shaft horsepower HTS900 gas turbine engine already found on many helicopters today, and falls in the “sweet spot [for shaft horsepower],” according to Bryan Wood, who runs the hybrid propulsion division for Honeywell Aerospace’s engines and power systems group. 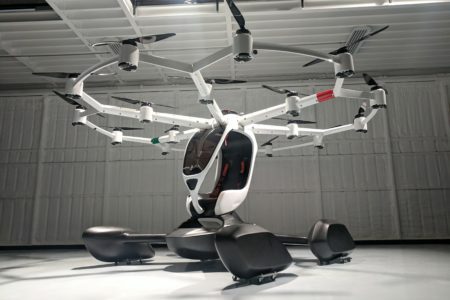 The engine is projected to produce 30 to 50 percent fewer carbon emissions than the traditional HTS900 engine, and Wood has mentioned that many customers are already very interested in using the engine in eVTOL applications. 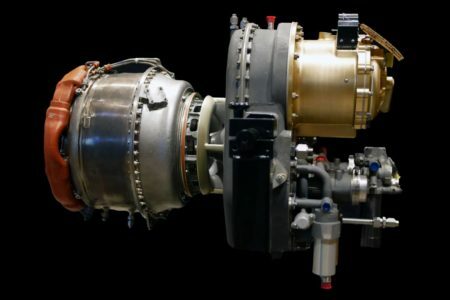 However, Honeywell plans to have an all-electric engine in the 2023 to 2025 timeframe that will use batteries and fuel cells, omitting the gas turbine completely. 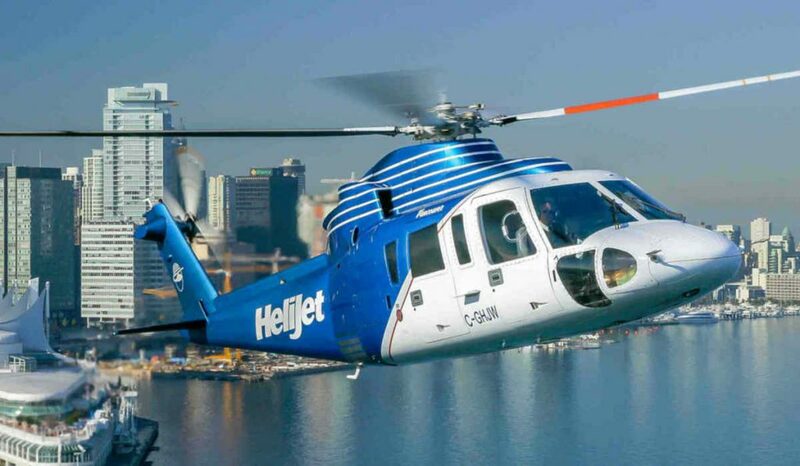 The current version of Honeywell’s turbogenerator was on display March 5 – 7 at Honeywell’s Booth during the show at this year’s Heli-Expo in Georgia. 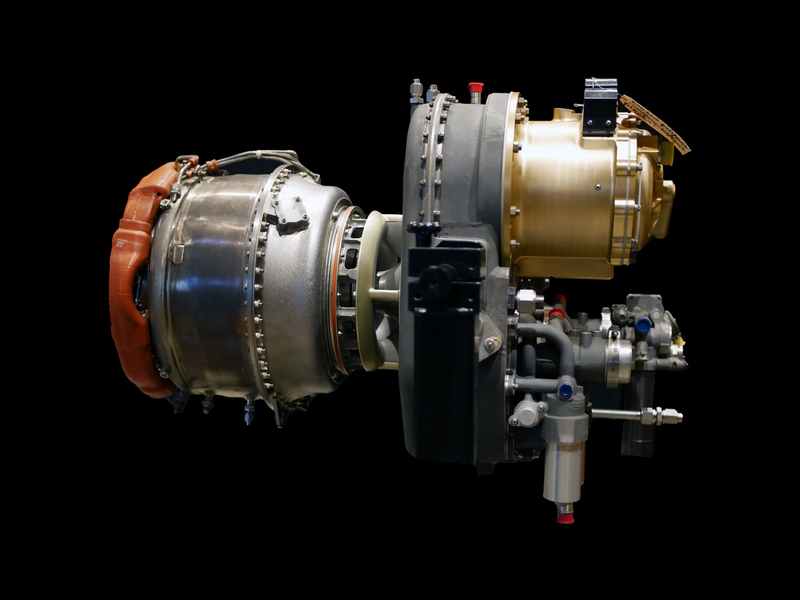 Why its important: As emphasized by Chris Hawley, marketing director at Honeywell Aerospace, the electrified version of the already-efficient HTS900 turbine engine will be cleaner, safer, and quieter than engines on the market today. This technology in which Honeywell has invested its resources has great potential to advance the urban air mobility industry and provide a feasible path forward for electric VTOL aircraft to begin commercial operations. LIFT's Hexa is a short distance single-seater eVTOL designed to work much like shared scooter systems in urban areas do today. Users will be able to fly Hexa Aircraft between landing ports in urban areas, guided by instructions from a mobile app. Hexa will take off and land autonomously, making the flight experience seamless. LIFT plans on initially launching in 25 U.S citizens, and is already takin pre-sale reservations. Vertical take-off and landing: Hexa flys on by 18 independent electric motors and propellors. Regulation: LIFT's is certified as a Powered Ultralight aircraft, meaning no pilots license is required to fly. LIFT CEO Matt Chasen has expressed his belief that making this smaller aircraft will put the Hexa in the air 'years before' other aircraft that transition to fixed-wing flight. 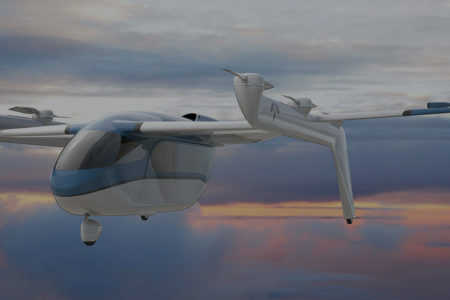 Funding: LIFT is currently taking pre-orders for flights in 25 U.S cities, each for around $200. It is also accepting inquiries for investment through its website. 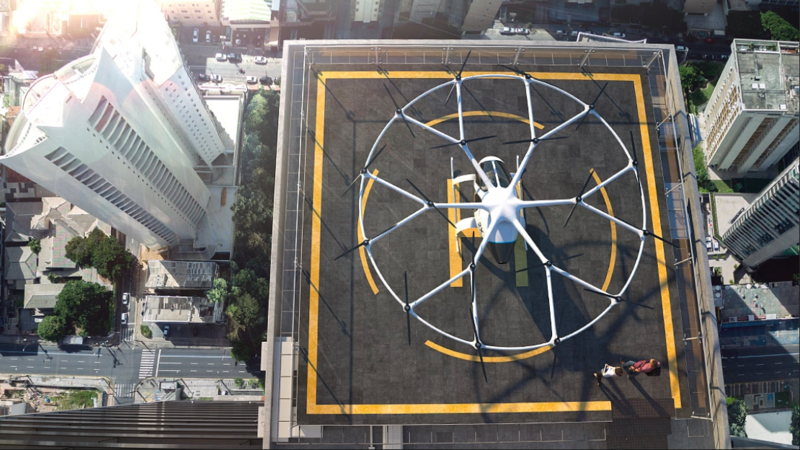 The idea behind Hexa, according to CEO and Founder Matt Chasen, is to make personal eVTOL flight available to the public sooner rather than later. By recieving its certification as a Powered Ultralight from the FAA, LIFT has made this possible, and is on the track to launching flights in Los Angeles, San Francisco, New York, and Seattle Fairly soon. However since the Hexa is smaller aircraft that for now is mainly aimed at recreation, it has a smaller opportunity for scale than the longer term fixed-wing transition air taxis such as the Bell Nexus. While other larger vehicles will be the 'Ubers' of the skies, Hexa will take the market for short-distance transport that shared electric scooters have in many major cities. Within ten years, VTOL developer Sabrewing Aircraft Company plans to bring cargo services to the Aleut Community of St Paul Island. The Aleut tribal community has ordered ten of the Sabre Wing aircraft, and are working with Sabrewing to develop a test range. Saint Paul Island is a small island off the coast of Alaska, only about 10 miles in length. Presumably, this makes the island an ideal initial test site for the Sabrewing VTOLs, as areas of the island can be difficult to reach by traditional cargo airplanes. Sabrewing plans to develop and test its aircraft in Anchorage, completing tests there for both Department of Defense contracts and commercial customers. Saint Paul Island as seen from the air. 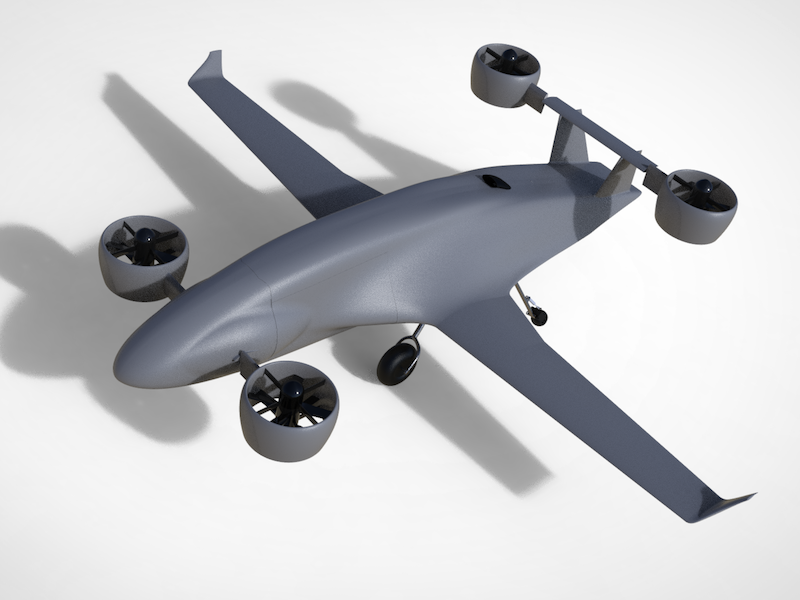 Rendering of the Sabrewing Aircraft Company cargo VTOL. Sabrewing plans on developing both two versions of its aircraft: one that with a payload capacity of 800 pounds and a later model with a capacity of 4,400 pounds. The company plans to power the aircraft with a hybrid system that uses a gas turbine to generate electricity for the electric motors. This design is similar to the one currently being tested by Rolls-Royce. According to Sabrewing, the ACSPI (Aleut Community of Saint Paul Island) has already begun various types of drone operations. 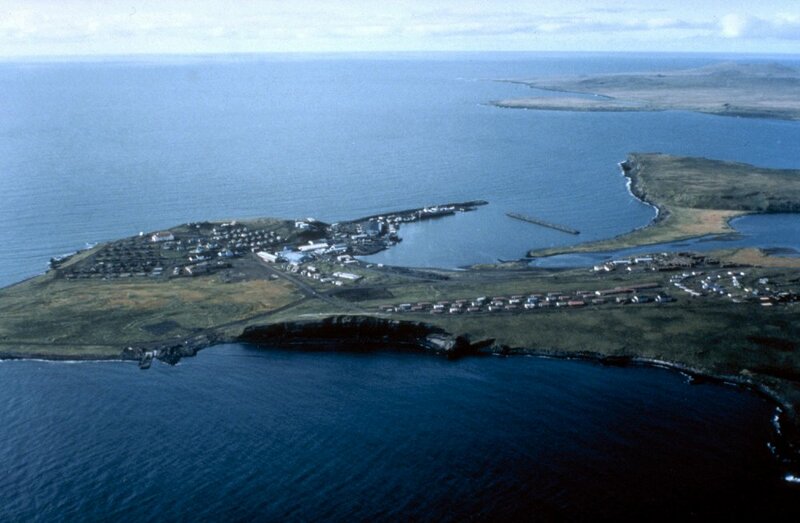 In exchange for testing facilities placed on Saint Paul Island, Sabrewing will provide equipment and training for the ACSPI community, who can then initiate and operate a complete test range complex. 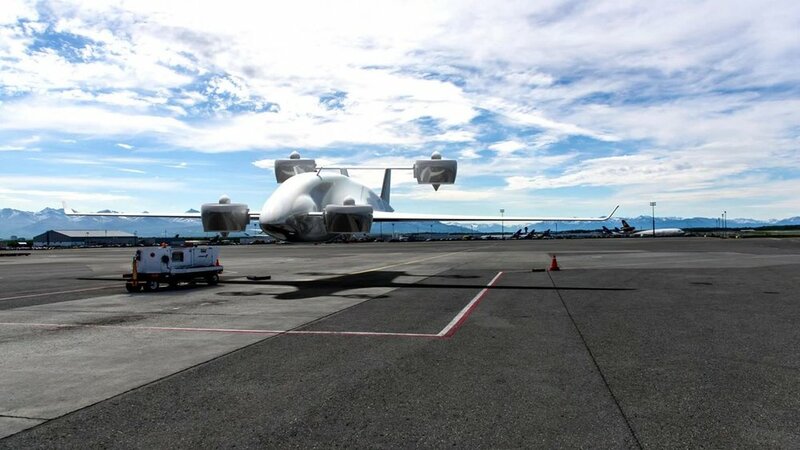 Why it’s important: With the Department of Defense interested in VTOL cargo operations by Sabrewing Aircraft Company, the implementation of VTOL services on Saint Paul Island may prove to be one of the fastest in the industry. 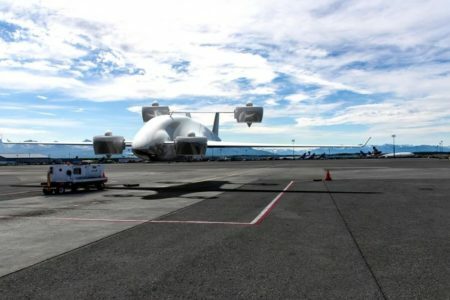 Saint Paul Island’s remote location and relative proximity to the Sabrewing base in Anchorage offers an excellent opportunity for system testing, giving Sabrewing the potential to take big steps for the VTOL industry. Russia’s Advanced Research Foundation (FPI) is taking another angle at approaching urban air mobility. The D-Dalus, a conceptual cyclocopter created by IAT21, an Austrian startup company. 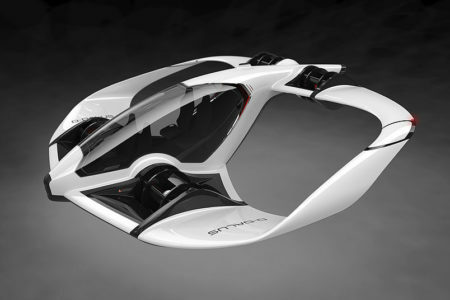 The FPI cyclocopter, a technical design thought up by the FPI, is a hybrid eVTOL vehicle driven by rotating, cylindrical wings, with each individual wing composed of many small paddles, or ‘winglets’. 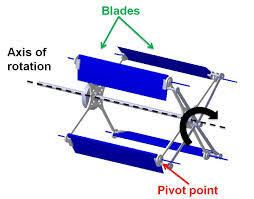 Utilizing this design, the cyclocopter can quickly change its direction of thrust by altering the angle of the paddles. Combining the elements of vertical takeoff and landing with conventional forward flight, the cyclocopter is an impressive design based off of the FPI’s conclusion that the their wing design will exhibit the best aerodynamic performance for an airborne vehicle. With better maneuverability than helicopters, a better ability to handle gusts, and significantly lower noise emissions, theoretically, cyclocopters are superior to rotorcraft. 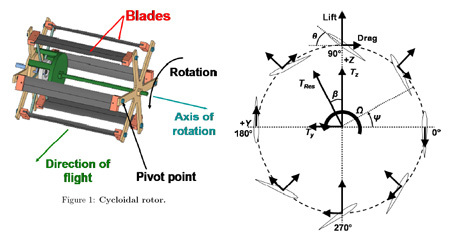 However, the main issue with ‘cycloidal propulsion’ is the scalability of the design. Larger rotor blades like a conventional helicopter blade generate lift through flow over the airfoil. Smaller rotor blades rely on generating lift through utilizing unsteady aerodynamics and leading-edge vortices, like an insect. 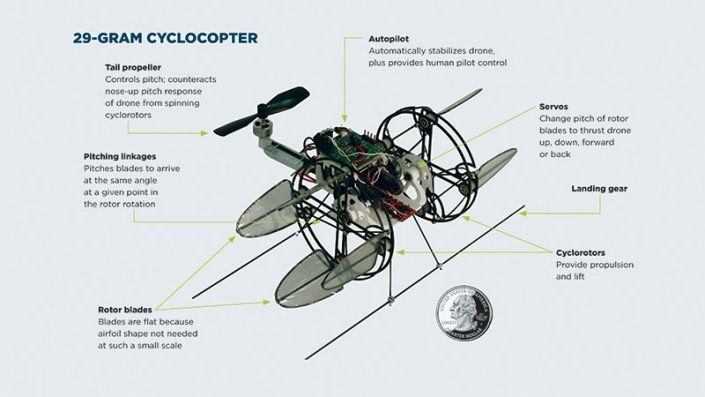 The latter method is what cyclocopters use, with teams like Professor Moble Benedict’s at Texas A&M’s Advanced Vertical Flight Laboratory successfully building the smallest cyclocopter ever (29 grams). But trying to go larger in size reduces the efficiency of generating lift. “There is a large rotating structure which has to be carefully designed to be strong enough to handle the large centrifugal loads, and light enough to be used on a flying vehicle,” says aerospace professor Moble Benedict of Texas A&M. In fact, the FPI reports to have finished separately building and testing the power plant, control system, and other components for their cyclocopter, and are now in the process of finishing their final design. Unmanned flight tests are scheduled for 2020 and manned test flights will follow afterwards. Why it’s important: If successfully built, a car-sized cyclocopter could be more maneuverable, efficient, stable, and environmentally friendlier than most of the UAM vehicle designs and prototypes today. 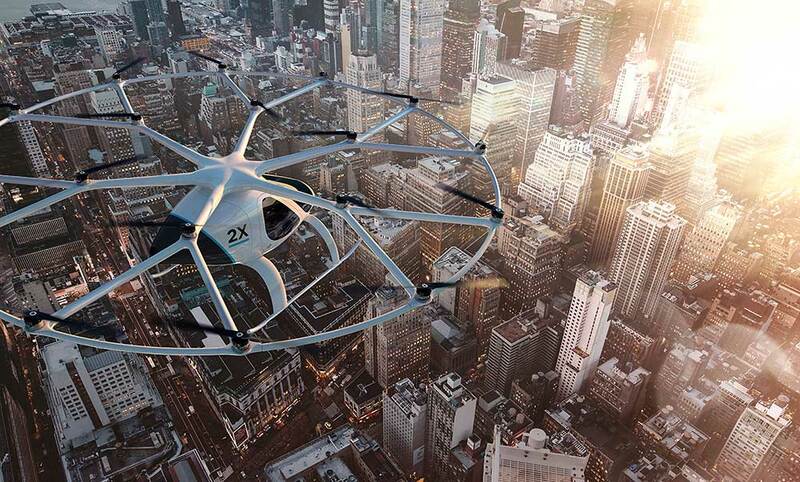 A small, agile flying machine easily able to maneuver in an urban environment with low emissions and noise levels and lower power requirements has obvious implications for the UAM industry, and urban transportation as a whole. 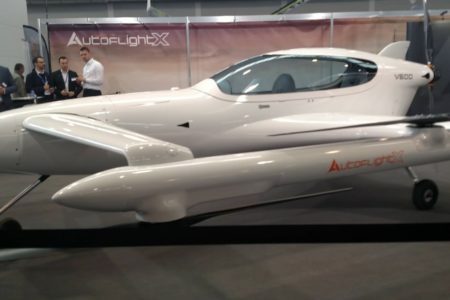 One of the most exciting reveals at the AERO Friedrichshafen 2019 in Friedrichshafen, Germany came from the German startup AutoFlightX, who showed off the V600, an eVTOL prototype designed for cargo and passengers. 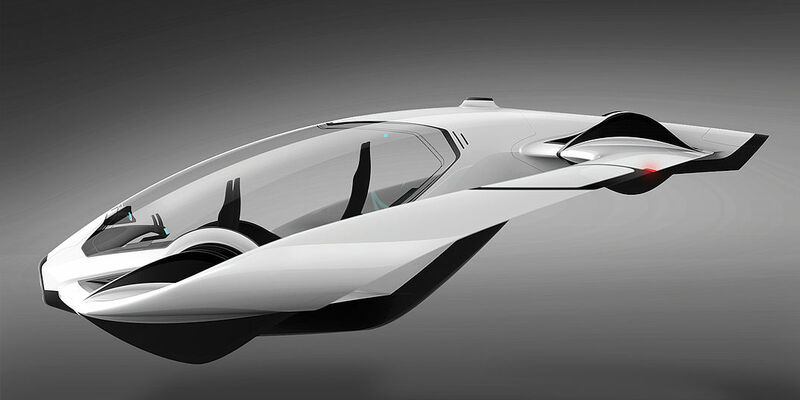 The V600, reminiscent of a futuristic P-38, was announced to be all-electric; a technical prototype two-seater intended to qualify under EASA’s new 600-kg threshold for ultralights, as well as to show off AutoFlightX’s work. It possesses six electric motors powering six propellers for vertical lift, with a seventh push-propeller for forward flight. The V600 has separate hover and wing flight propulsion systems, intended to increase the overall efficiency and reliability of the machine. The V600 was finished a few weeks ago, and AutoFlightX control systems modeling and simulation specialist Michael Krenmayr said that they will be testing it for conventional flight in the upcoming weeks, followed by testing for vertical lift and hover testing. 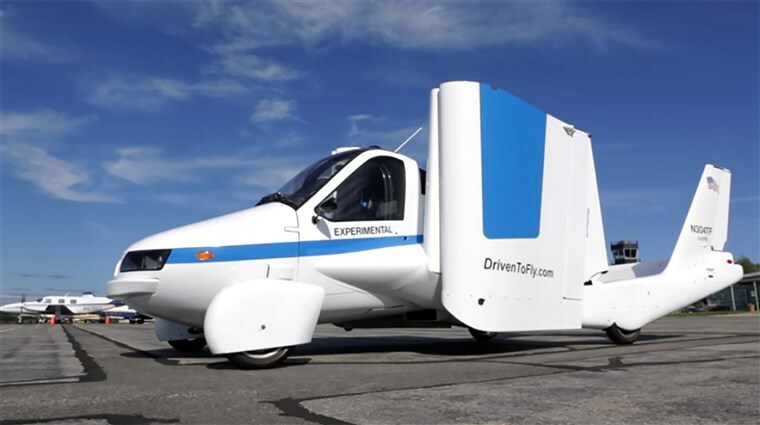 By working out the conceptual design through these rigorous tests, AutoFlightX plan to take their results and apply any fixes needed towards their final product — not yet revealed — while simultaneously garnering interest and buzz around the public. 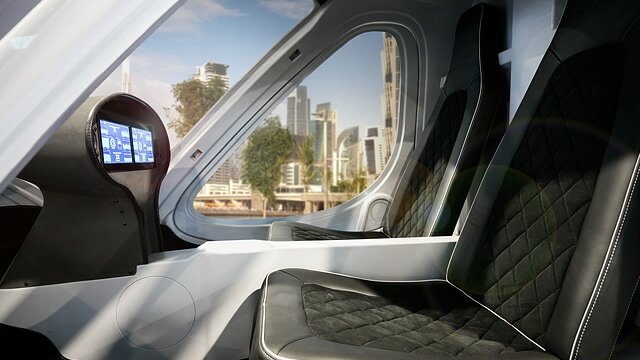 While not too many details about the final vehicle have been released, Krenmayr did confirm that it will be capable of carrying three to five passengers, and involve some differences from the V600, like propeller placement, in order to meet EASA certification requirements. Ultimately, AutoFlightX plans to have their final product finished in time for 2023, where it will be ready for cargo flight. 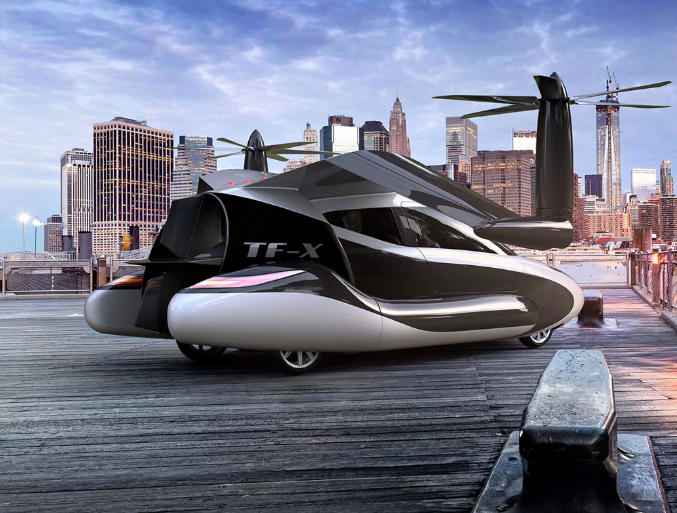 AutoFlightX also plans on releasing a manned air-taxi version of their final vehicle a few years after 2023. Why it’s important: The AERO Friedrichshafen 2019 provides an exciting opportunity to get a glimpse at the upcoming technological innovations in the UAM and aviation industry. 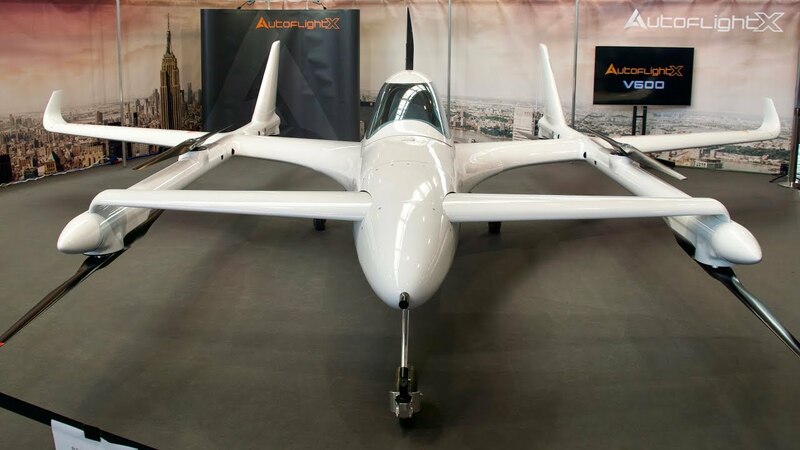 With AutoFlightX’s V600, it shows that more and more companies in the industry are going through with the idea of urban air transportation with alternative energy means. The V600 itself will be an interesting comparison to AutoFlightX’s final product in terms of the design and aesthetic changes it will undergo to meet certification requirements and pre-existing regulations, a valuable benchmark for other companies in the UAM industry to take note of.